Return with me now to the days of yore... When James Whale directed a musical, and everything was right with the world. 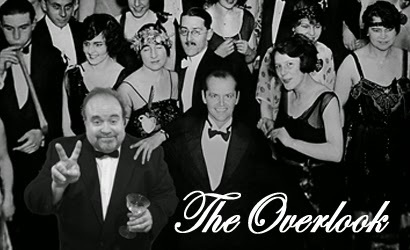 One of the more nefarious practices in the golden age of Hollywood was for major studios to buy the rights to an older film so they could do something that I’ve named “putting it on ice": remake the film, then bury the original version so that no one can see it again and compare it to the new version. The best (worst) example of this concerns the MGM remake of Doctor Jekyll and Mister Hyde from 1941. Because they owned the rights to the earlier film, MGM made it almost impossible to see the infinitely superior 1931 Paramount version for thirty years or more. Boo. Later, MGM went bankrupt and became little more than a holding company for the James Bond franchise... so I guess Dr. Jekyll got the last laugh on that one! And that would be the laugh of a crazed literary mad scientist... the laughiest laugh of all. Of course, "putting films on ice" still happens today, but now it is mostly due to the pedestrian tastes and preferences of cable channel television programmers, who must mistake film for food because they think if something is old enough, it will poison you. Frequently, as I channel surf (don’t judge me, Judgey) I encounter movies on the cable programming guide grid that get me excited, but the title almost always proves to be the inferior remake, which I am guessing will run in place of the original in perpetuity. A few examples: The Longest Yard (I love the original; it was one of the first R- rated comedies I ever saw) almost always turns out to be the 2005 Adam Sandler atrocity. The new version of The Thing seems to have completely usurped the John Carpenter classic on basic cable. Newer versions of Evil Dead, Halloween, House on Haunted Hill, and The Haunting are all much more ubiquitous on cable than their infinitely superior precursors. And so it was with Show Boat. While I do not wish to turn this week’s column into an exhaustive list of the differences between James Whale’s (superior) 1936 version—which was put on ice by the lavish 1951 MGM remake—suffice it to say that the two films have different aims. While the original Whale version gladly mixes social realism (and more of the original Broadway show) with its own charming songs, the MGM version aspires to nothing but mindless spectacle and escapism. The Hattie McDaniel character Queenie is largely written out of the remake; Joe’s screen time is also substantially reduced. MGM obviously did not feel that concepts like slavery and miscegenation were a good fit with Ava Gardner and Technicolor spectacle. One thing that has kept the 1936 Show Boat from being more widely screened is undoubtedly its retrograde depictions of African-American performers. For instance, only the 1936 film retains the Broadway number where Helen Morgan’s character performs in blackface. It may be that MGM thought a minstrel show did not show off its beautiful Technicolor to best advantage; but it’s also true that, by 1951, Hollywood was ready to accept the fact that minstrel shows were offensive and disrespectful. Unfortunately, 1951 Hollywood rarely offered to correct past embarrassments; the answer was simply to pretend they never happened. Another thing that kept Universal’s 1936 Show Boat out of circulation until the 1990s was star Paul Robeson’s political beliefs. 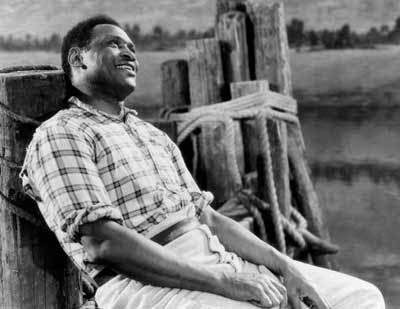 The role of Joe was specifically written for Robeson, who also played the part on Broadway, and his terrific performance of “Old Man River” is as iconic as they come; but the fact that Robeson was blacklisted in the 1950s effectively kept the 1936 movie out of repertory theaters and off television until seven years after his death. Because the fact that a single performer may or may not have held unpopular political beliefs should bury a film for decades, right? 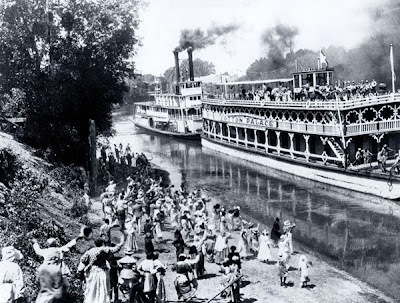 The Plot in Brief: The showboat “Cotton Palace” arrives in Anytown, Mississippi and the town’s various citizens are happy to have some entertainment beyond watching black people do all their work for them. 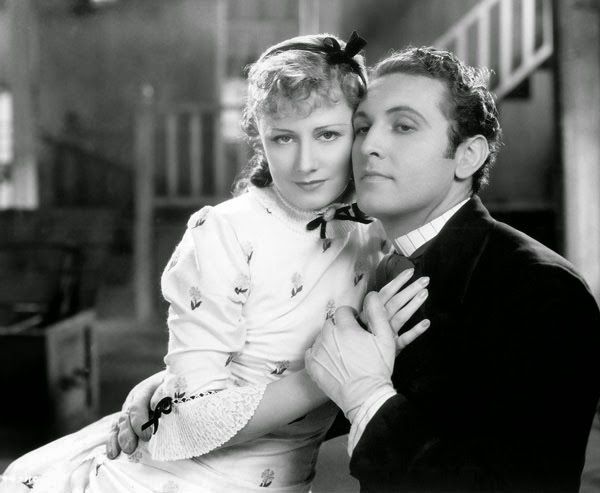 The main plot thread focuses on a romance between gambler Gaylord Ravenal (Allan Jones) and the show’s leading lady, Magnolia Hawks (Irene Dunne). Some bracing social realism involves another performer, Julie LaVerne (Helen Morgan), who is black but passing for white, being arrested for marrying a white man, Steve Baker (Donald Cook). Joe (Paul Robeson) both comments on the passing scene and has an ongoing relationship with Queenie (Hattie McDaniel). Rare for a Broadway musical, the narrative follows these characters over a span of some forty years. There is hubris and heartbreak; Magnolia and Gaylord wind up marrying, having a child, splitting up, and... I shan’t spoil it. Suffice it to say... that it is very sweet. The reason I was most excited to see this film is its James Whale connection. Having fallen in love with his groundbreaking, iconic horror films (Frankenstein, The Invisible Man, The Bride of Frankenstein) I wondered what his work would look like in a very different genre. Well, let me tell you, Show Boat is a chance to see what Whale could really accomplish with a lavish budget and longer shooting schedule. It’s breathtaking. Whale’s eye for composition and camera movement is keen; the razor-sharp transfer on the (newish) Warner Archive disc conveys this well. Whale’s canvas is more expansive here than in his horror pictures: the sets are bigger, the tracking shots longer, and the number of extras easily ten times that of the village mobs in The Invisible Man or Frankenstein. The use of parallel montage in “Old Man River” is stunning—a mounting series of images illustrating Robeson’s iconic voice and lyrics, made from many separate pieces of film that all took time and money to light, shoot, reshoot, and edit. Whale’s Show Boat makes me wish that Bride of Frankenstein were a musical. I highly recommend the original Show Boat. Still, one caveat: parts of it are retrograde, racist, and embarrassing. I get that. Still, I have always had a problem with regretful parts of this country’s history being shut away so that we might pretend they never existed. Is there not something patronizing (and oh-so politically correct) about keeping cinematic treasures away from audiences who have been deemed somehow “not able to handle” certain depictions or words? What are we, babies—babies? We know the film is from the past and about the past; perhaps it more accurately presents that past than the whitewashed, white bread version of history spoon-fed daily to young people in our public schools. Part of our country’s current race problem may originate with those few sheltered people subscribing to the comfortable lie that a race problem doesn’t exist. Perhaps it’s good to be embarrassed by the failings of our past; it reminds us that we need to keep working on developing our better selves. 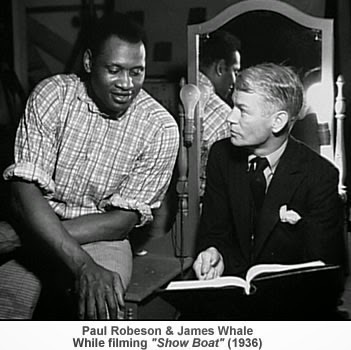 The 1936 Show Boat deserves to be seen as historical document, as new insight into a favorite director, and most importantly as grand American entertainment, warts and all. WARNING, BABIES: After screening it, you will not be able to get “Can’t Help Lovin’ Dat Man” out of your head; it’s that catchy. I love this article JB. I think the original version of Show Boat is far superior and the way you describe Whale's mastering of the genre makes me want to see it again. I have watched the Carol Burnett parody of the 50s Show Boat quite a few times as I think she nails all the things I found frustrating about it. Bjork did a nice version of "I Can’t Help Lovin' Dat Man" on the 1990 album Gling-Glo. Billie Holiday's version is probably my favorite though. Always been a fan of that Jazz standard. The 1936 Show Boat is one of my favorite musicals. In addition to "Old Man River" and "Can't Help Lovin' Dat Man," it has "I Have the Room Above Her," which Kern wrote specifically for the movie (along with "I Still Suits Me" and "Gallivantin' Around"). Just FYI, it's actually Irene Dunne who sings in blackface - and it's every bit as uncomfortable to watch as you might think. Just one example of how ridiculous the 50's Show Boat was: actual Show Boats had no engine, and were pushed by a paddle boat dedicated to the task. The Technicolor Cotton Blossom is a standard paddle boat all by its lonesome, making one wonder how they fit a stage into where the boiler would be. I've seen the 1951 version so many times....I was named after Kathryn Grayson. This James Whale version was a revelation as it includes Black characters as more than background filler. Of course, it's also an embarrassment with Irene Dunne not only in blackface but mugging to the back row. It makes the blackface in Crosby's "Holiday Inn" look respectful.